Lauren comes to grips with the knobby, pocketed, volcanic tuff that makes up Smith Rock's iconic skyline. Below, the Crooked River meanders through the desert landscape. 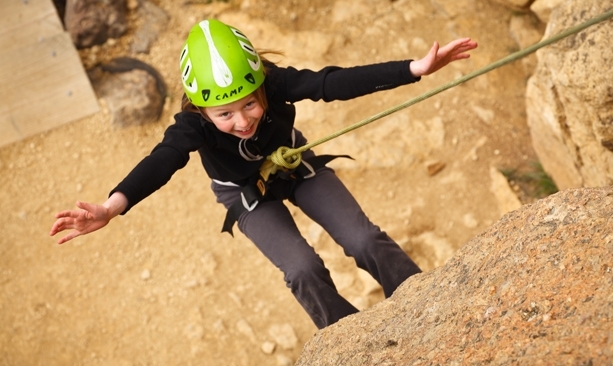 Lauren celebrates summiting Night Flight, a popular and easy climb at Smith Rock. 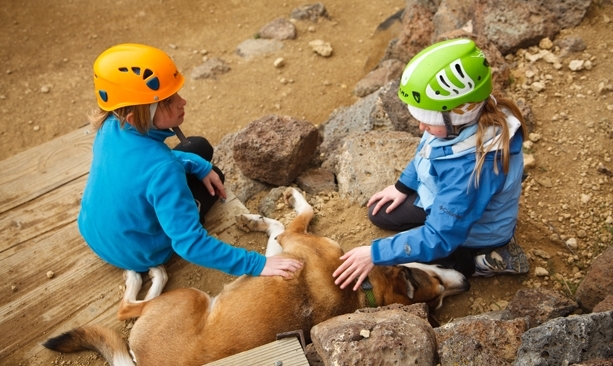 Post-climbing catharsis: Denali the dog welcomes Jenelle and Lauren back to solid ground. Jenelle and Denali soak up the sun while Lauren watches Patty climbing. Lauren scopes a golden eagle nest while Kent and Patty compare notes. Volunteer Interpreters Patty and Ray Hale man an information kiosk during the first half of the year. At the Gazebo, Volunteer Interpreters Patty and Ray Hale provide information about the park's golden eagles. 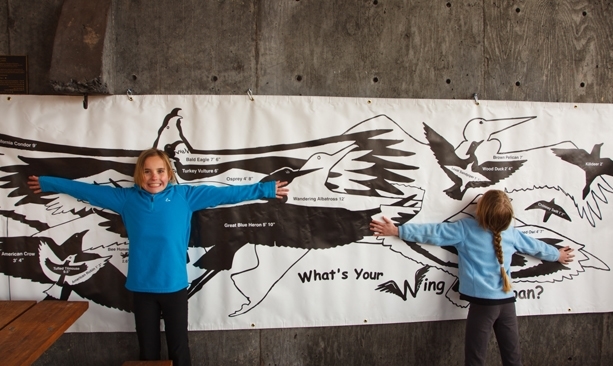 Here, Jenelle, 9, and Lauren, 7, compare their wingspans to those of common birds. The verdict? Jenelle is slightly larger than an osprey, while Lauren could fly with a great horned owl. 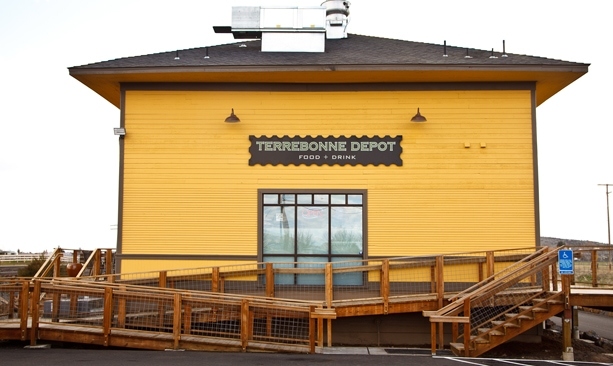 The original Terrebonne Depot building was bought and renovated during the last decade. Although the building stood for almost 100 years, its aging, wood foundation had to be replaced. To do so, owners Kristin and Ian Yurdin dragged the entire building 36 feet to its current location. The former wood piers footings were re-purposed as the restaurant's bar and tabletops. From left to right, Jenelle, Lauren, Kent and Patty Neumann enjoy a delicious, hard-earned meal. The Depot menu offers a wide range of tasty fare, including jalapeño-fried calamari, rib-eye steak, pizza, burgers and chocolate-banana bread pudding. Lauren leads the way along Maston's rolling, scenic singletrack. The Newmanns take a breather, overlooking the Deschutes River with guide Chris Bowman. Baldy's BBQ serves up no fewer than 12 different kinds of carnivorous creations. But as these plates attest, it's hard to beat the ribs. The young rock climber was ecstatic. One more move and Lauren Neumann had reached the top of Night Flight — her chosen climb at Smith Rock State Park. At the summit, she threw out her arms and hollered at the top of her seven-year-old lungs, having just completed her first-ever outdoor climb. 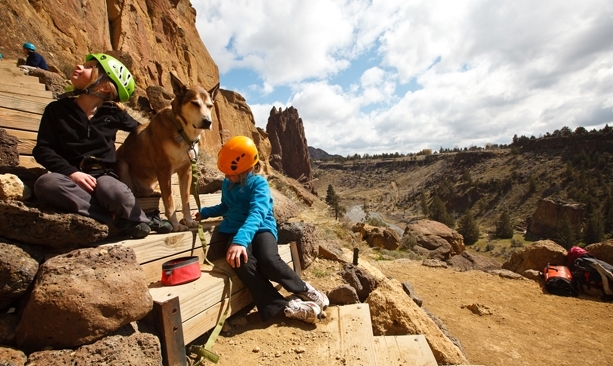 When most people think of Smith Rock, they envision an exclusive playground for hard-core rock climbers. 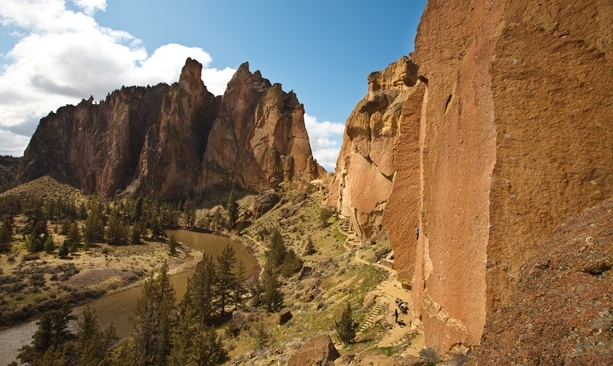 Located 26 miles north of Bend, Oregon, the 623-acre park is internationally renowned for climbing, containing thousands of technical climbs of various ratings. But Lauren, her parents Patty and Kent, and her nine-year-old sister Jenelle discovered firsthand that this scenic outdoor wonderland has much more to offer. If a visitor to Smith remembers one thing, it will be the iconic skyline, with its towering, golden spires and subsidiary ramparts. These geologic wonders were formed by a volcanic eruption more than 14 million years ago. Across the river, one can glimpse much younger, blocky cliff bands of the more common Newberry basalt. Smith Rock sits surrounded by arid high desert. Yet its towers of stone, located near the deep Crooked River Canyon, form an oasis of sorts. A riparian corridor hosting a rich ecosystem, the park is home to mountain lions, deer, river otters, and bald and golden eagles. Pairs of resident golden eagles return year after year to nest high on the rock faces, aeries that can weigh as much as 1,000 pounds. During their visit, Jenelle and Lauren talked with volunteer birders Patty and Ray Hale about the eagles, and used a spotting scope to get a peek at a mother eagle sitting on her nest while her mate hunted. New to climbing, the Neumanns got help from Gabe Coler, a friendly guide at First Ascent Climbing Services. 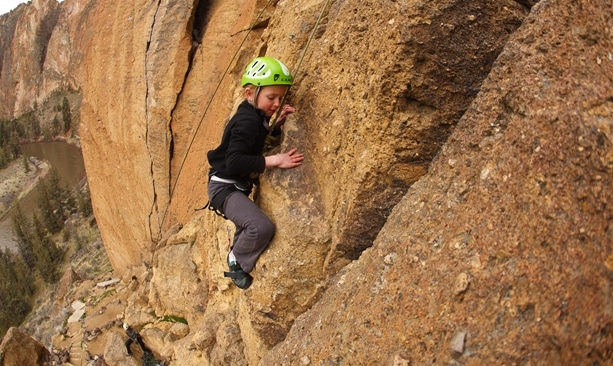 In addition to climbing, Smith Rock also offers miles of hiking options. Any sunny weekend day will find many hikers enjoying more than 12 mile of trails. The popular River Trail covers some 6.7 miles of scenic landscape, including a world-class, panoramic view of the Cascade Range. Many other less strenuous options extend to the east and west on both sides of the river. 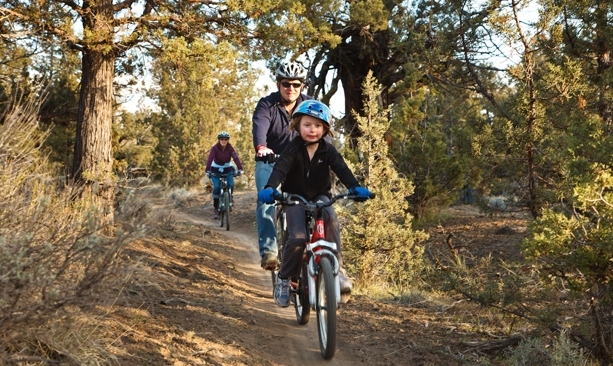 Mountain bikers also frequent the park, enjoying the family-friendly, rolling River Trail, as well as more technical riding in backcountry areas. (As of this writing, the River Trail was washed out 1.5 miles in. Check with the park office when planning your trip or visit Central Oregon Trail Alliance for trail conditions and access information.) The nearby Maston trail system offers a similarly mellow scenic alternative. 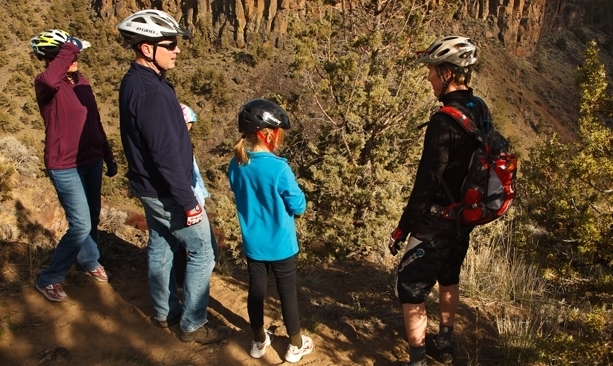 Chris Bowman, a guide with Cog Wild Mountain Bike Tours, led the Neumanns on a winding single-track loop through juniper and pine forest to a bluff overlooking the Deschutes River where the family caught views of Smith Rock and the Cascades during the ride. At the end of the day, all activities led the family to the same state: hungry! They stopped at Juniper Junction, just a few hundred yards from the park entrance, for wild huckleberry and mountain blueberry ice cream. For a more substantial meal, they made their way to the nearby Terrebonne Depot. 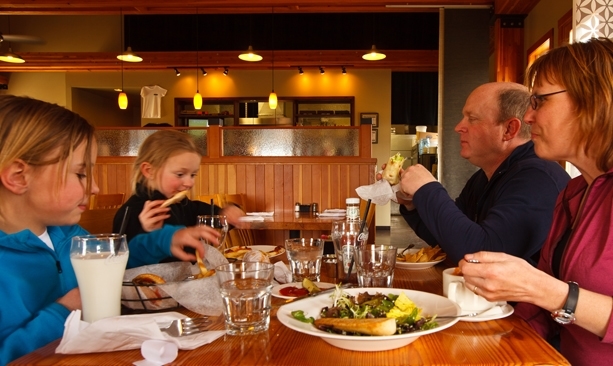 Owned by local climbers Kristin and Ian Yurdin, the Depot offers a wide array of delectable local cuisine. 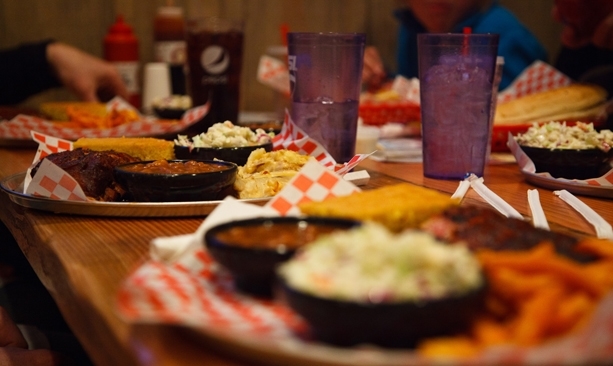 Baldy’s BBQ, located to the south in the town of Redmond, offers another dining option. The Bend-based company opened the Redmond location this spring, and serves tasty ribs, pulled pork, chicken and brisket — all smoked in-house. With full stomachs and tired muscles, the Neumanns headed home determined to return soon for more of Smith’s scenic beauty and outdoor fun. Smith Rock is an incredibly popular destination for hikers, bikers, climbers and sightseers, particularly in the summer. During the peak season and times, expect to find parking challenging and trails crowded. 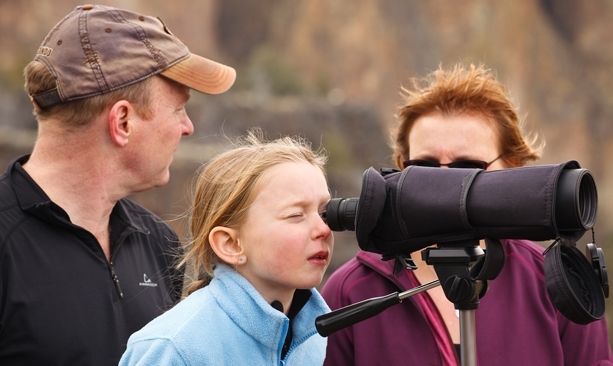 For the best experience, visit Smith Rock during the week and during the less busy seasons. Do your part to preserve Oregon’s natural wonders. Follow leave no trace principles and pack out your trash when you leave.